Apple has finally released its much awaited version of iTunes 11.0.1 Software for Macintosh and Windows operating systems. Apple iTunes v.11.0.1 for Mac and Windows is completely a revamped, fast and secure version with most advanced features and updates for iPhone, iPad and iPod Touch device users. Apple iTunes 11.0.1 has also brings back detection of duplicate library items and also addresses an issue where new purchases in iCloud may not appear in your library if iTunes Match is turned on and fixes a problems where the AirPlay button may not appear as expected. Direct Download Link of iTunes 11.0.1 for Macintosh (.DMG Setup File) and Windows (.EXE Setup File) is officially available below. 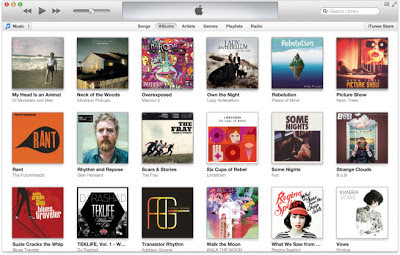 Apple iTunes v.11.0.1 have got simple and beautiful design and look with completely redesign player and remodeled store with the integration of several iCloud features. Apple iTunes v.11.0.1 also has New MiniPlayer with small on space and big on control option and users can also preview their history by simply click on a single button. iTunes 11.0.1 is also compatible with all Jailbreak iPhone, iPad and iPod devices which means all Jailbroken iPhone, iPad and iPod device users can also sync all data, music, videos etc. with the latest version of iTunes and can also restore Jailbroken idevice using iTunes 11.0.1 so what you're waiting for? Just Download and Install iTunes 11.0.1 via Direct Download Links available for Mac and Windows operating systems.